Today we have our first post from our September Guest Designer, Tracy Freeman! We are so thrilled to have Tracy designing with us this month! Her bright and cheerful card designs have definitely made us smile! We can't wait to share what she creates with our stamps! Keep reading to find out more about Tracy today and to check out her first project below! Hi everyone I am Tracy, otherwise know as Inkyfingers and Ribbon. I live with my very understanding, and at time enabling husband and our 6 furbabies (4 cats and 2 dogs). I have been crafting in one way or another for over 15 years now but only took the leap into blogging a few years ago. I love to stamp and colour and even now it always amazes me what we can do with some ink and paper. I LOVE all things Newton and did a happy dance when I was asked to guest design for them. Hi everyone my name is Tracy aka Inkyfingers & Ribbon and I am super excited to be Newtons Nook Guest Designer for September. I have to admit I have been really nervous about my first post so I do hope you all like it. 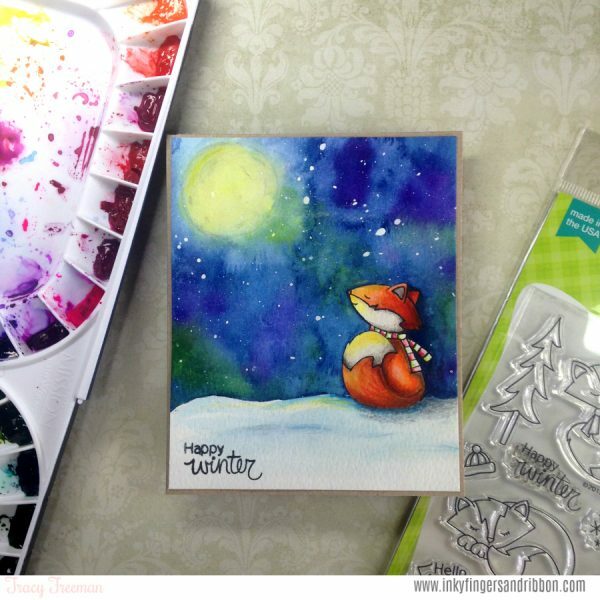 I am a total sucker for cooler weather and love winter and autumn, especially the cold crisp evenings I really cannot get enough of them and always think the sky is so beautiful during cold weather and I wanted to capture that with this card and knew the Fox Hollow Stamp Set would be perfect for it. I decided to use watercolours for this and stamped the cute single fox on his own onto some Canson watercolour card and then used some masking fluid to mask him off whilst I created the sky. I wanted lots of colour and depth to the sky so did a couple of layers of colour and allowed it to dry. When I coloured the fox I decided to try and give him a "moon glow" Im not sure how well it worked as this was my first time trying it. For the snow/ground area I used some white acrylic paint and mixed it with some the colours I used on the sky to give some dimension and depth to it. I also flicked some of this across the sky to create a "snow" look. Once dry I added some sparkle to the moon using Spectrum Noir clear Sparkle pen and stamped the Happy Winter Sentiment from the same stamp set. I did debate about adding some twine or embellishments but decided to just leave this as a simple scene card. I hope you like it and I cannot recommend this stamp set enough, its beautiful to colour and I have so many ideas for it. 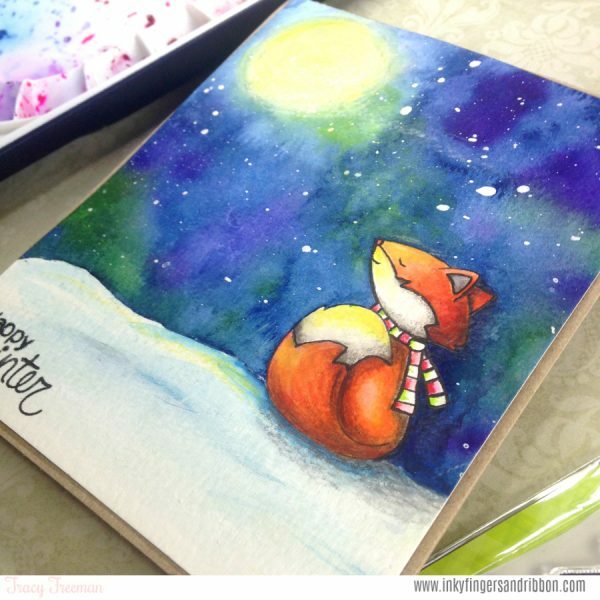 This card is so sweet and your watercoloring is gorgeous! So pretty and I agree your watercoloring is gorgeous! I was admiring your moon glow fox before I read your text ;) I think it turned out absolutely gorgeous!! Your coloring is really fabulous!!! I like your card a lot, it is just wonderfull. You did a super job on the sky....just amazing! Awesome!!! I love the way you watercolored your sky. It's neat how it shines off the fox tail too. Great job. Wow ! Your card is stunning, I love it !